According to British Gas, average gas bills fell 2% in the first three months of 2010, despite the coldest winter for a generation. 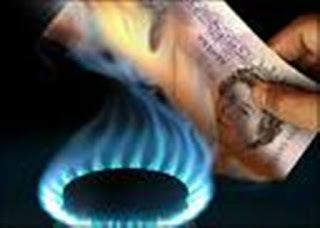 The average gas bill – between January and March of this year – for the 8m homes supplied by the company fell to £373, compared to £381 in the same period of 2009. A large part of the reason for this is that consumers are increasingly seeing the benefits of installing more efficient central heating boilers and gas fires. 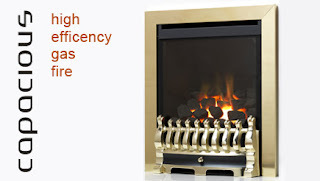 For example, if you have an open fronted gas fire that is over 5 years old, it could be as little as 25% efficient, using as much as 9.45kW of energy to generate only 2.4kW of heat, with the rest of the heat going straight up your chimney.Fireplace Supermarket's latest gas fires, such as the innovative Apex Capacious and Verine Orbis models are contributing towards this gas efficiency trend. They are incredibly energy efficient of up to 89% so under 5kW of gas being used to put 4kW of heat into your living room. This means that by upgrading your old open fronted gas fire to a high efficiency glass fronted fire, you can save 57% on your gas fuel costs and have 46% more heat. Wow Crystal Fires release a stunning HE (high efficiency) gas fire called the Montana, and is set to light up the showroom (and Internet) sales across the UK. Here at Fires/Fireplaces/Stoves we love supporting the UK manufacturers and the great thing about Crystal Fires is they make it easy for us to do just that by producing high quality fires time and time again. 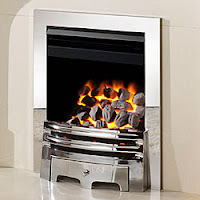 The Montana HE gas fire is an inset glass fronted gas fire, it has similar looks and design to the other Crystal fires on sale, however Crystal boast that their high efficiency Montana has the same high heat output as the extremely popular Crystal fires Gem (4.2kW) but consumes only half the gas input, which means the same heating for half the cost!......superb. The Montana comes with a selection of finishes, the standard HE version allows a traditional trim with a choice finishing effects and trims, but you can opt for a modern styled fire by having a majestic or contemporary crystal fires fascia, which still provides the same stunning operational figures. 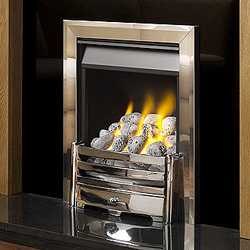 The option for a remote with the Montana is available, but I fear the additional cost may put many people off, however if your going to have a really cool high efficiency, highly effective gas fire I'd get the remote if you can afford to just because it finishes off this classy fire perfectly. Great job crystal fires, and we look forward to the next product update. Almost nine in 10 households (89%) will be rationing their energy use this winter to save on bills, meaning a potential 23 million households will be switching off or turning down their heating, according to uSwitch. It says an average £224 increase in energy prices within the last 12 months has left 87% of consumers worried about the cost of this year's winter fuel bill. In October The Guardian asked readers for their tips on cutting energy bills. They were contacted by a retired 66-year-old retired academic who worked at a London university. She spent half her working life caring for her children and doing voluntary work, which reduced her pension, so she now makes an effort to keep her heating bills down. She has taken rationing her energy use to a new level, and she wanted to share her methods. "People talk as if very high energy bills are inevitable, whereas often these could be cut a little or a lot, and in ways that can improve our quality of life. I've just had my quarterly bills: electricity £7.44 (+ VAT + standing charge = £12.89) and gas £7.88 (+ VAT but minus dual fuel discount = £4.75). "If you asked me to score my quality of life from one to 10, I would definitely say 12 plus. "Three years ago I moved house, and chose an end-of-terrace home with a south- and west-facing living room, and no nearby tall trees or buildings. The living room has patio doors and even in deepest winter, on sunny days, it heats up to more than 20C. If you have any blank walls that face east or west, but preferably south, could you possibly put in a double-glazed window? The larger the better. Patio doors heat up rooms much more than ordinary windows do. "Insulated cavity walls and roof increase the winter warmth. I have carpets here – much cosier than the laminate floors in my last home – and cream 'blackout' curtains which give excellent insulation. "I do not use central heating. Instead, I use the warm living room almost all the time in winter. Okay, the other rooms are chilly. But does that matter as long as you only need to use them briefly during the day, and you have one really warm room, or two for larger families? "For unheated bedrooms you can use one or two – or three – hot water bottles (from the burner kettle) and lots of warm covers. It can be more pleasant to sleep in a warm bed in a cold winter room than in a hot summer bedroom where you cannot control the temperature. "Maybe you are thinking about the misery of cold kitchens and bathrooms. During winter I prepare food, and the hot water for cooking and washing up, in the living room – so need to spend little time in the kitchen. Jackets and jerseys are handy for longer spells in the kitchen. Living in inner London I have shops near by. I use them as my main larder, so I can do without a freezer, and I turn on my fridge only briefly to cool white wine, or occasionally for the grandchildren's ice-cream. Food keeps well in cool kitchens. "I buy milk every other day, and keep the carton in a jug of cold water. Shopping every day or two ensures that food is fresh and varied. Another advantage is not having a fridge full of stuff near its end-of-shelf life, which helps to reduce overeating and throwing away stale food. "The bathroom is the other great energy consumer. 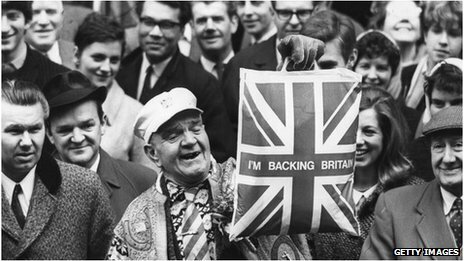 Older people will remember how in the 1940s-1950s we tended to have a bath once or twice a week. Advertisers have lately persuaded us that it is unhealthy and disgusting to shower less than at least once a day. Yet a quick wash, with water from a kettle, is fine for most days – or a leisurely wash in front of the burner. Baby wipes are a great invention, and I can guarantee no one will guess if you haven't had a shower for five days. That's how our academic cuts her costs. Saving that much money clearly takes a lot of effort, so would you be willing to go that far in the name of smaller utility bills? While her ideas seem to do a great deal to reduce fuel bills overall and the idea of using a woodburning stove to provide the main heat for a room is a great idea. Especially when using a Stove fan to help circulate the warm air around the room. However it seems to me that her determination to cut energy bills is driving the cost of general living up, for example I think it would be cheaper to pay for the cost of heating water for a shower every day or every other day rather than a constant supply of baby wipes! Also the cost of running a modern, energy efficient Fridge Freezer also would be less than the cost of buying food on a daily basis from a local shop, which can often be more expensive than a weekly or half-weekly shop from a supermarket. With the UK's major energy suppliers bumping up their prices by up to 18% this winter, the belated arrival of the cold winds represents a great opportunity to look at ways of cutting your fuel bills. The imminent announcement of a consultation on the government's Green Deal, which aims to help you make your home more energy-efficient, should provide an added incentive. And there are lots of ways you can save money - in some cases a great deal - just by making a few simple upgrades to your home. Some improvements cost virtually nothing and can take a matter of minutes to install; others require a bit of capital and expert help. Others still require small changes in habits that should more than reward the effort. All are well worth considering. According to the Energy Saving Trust (EST), the average household could save about £280 a year on its fuel bills by being more energy efficient. Bearing in mind the average bill is about £1,300, that's quite some saving. This equates to more than a tonne of carbon emissions every year, thus helping to combat rising global temperatures. There are plenty of schemes around to help you get a better idea of what upgrading your home to make it more efficient actually involves. Old Homes Superhomes is one such project, which is supported by the National Energy Foundation. Sarah Harrison, head of Eco-refurbishment, says the scheme can help people understand not just the financial benefits of so-called retro-fitting, but also how upgrading homes can improve your quality of life. Insulation When it comes to energy efficiency, the smallest measures are often the most effective, so insulation is a good place to start. The most cost-effective energy efficiency measure you can use is to place kitchen foil behind your radiators to reflect heat, according to the National Energy Foundation. Doors and windows can then be sealed quickly and easily using self-adhesive foam and rubber strips, and draught excluders. Seal up any gaps between your floors and skirting boards and, together, these measure could save you more than £50 a year, according to the EST. Next look at insulating your loft and walls properly - about a third of an uninsulated home's heat is lost through the walls, and about a quarter through the roof. Walls will require varying degrees of works depending on their construction, but proper insulation can save hundreds of pounds a year. Just topping up your loft insulation can also shave a substantial amount off your annual bills. Also look at secondary and double glazing - almost 20% of heat loss from the average home comes from windows. Heating Upgrading old electric storage heaters to modern alternatives can save you more than £100 a year, and in some cases considerably more. Replacing an old, inefficient boiler with an A-rated condensing model could save as much £300 a year, although you will have to decide whether this is worth the £1,000 to £2,000 cost of buying and installing one. Even fitting a room thermostat could save you more than £50 a year. Energy-efficient behaviour You may scoff at the point of turning off appliances when you're not using them, but add up all the savings and they can be worthwhile. For example, switching plugs off at the wall and avoiding standby mode on TVs, computers, stereos and the like, together with switching off lights when you don't need them, could save you almost £50 a year. Wash your clothes at 30 degrees instead of 40 and don't use a tumble dryer in the summer, and you could save another £30. Upgrading appliances/electronics If you need to replace any domestic appliance, then it may be worth spending a little extra to get the most energy-efficient model you can afford. Some fridge/freezers with an A+ energy rating can be incredibly affordable. They are all rated by law, from A to G, so you can tell how efficient they are. However, there is a great deal of variation within these bands, so also make sure you look at the specific figures on energy consumption. Some appliances, such as dishwashers and washing machines, also have grades A+++, A++ and A+. Very roughly, a new efficient appliance could save you between £20 and £40 a year on energy bills, according to the EST. More modern consumer electronics are also more energy-efficient. And if you're looking for a new television, bear in mind that LED TVs are more efficient than LCDs, which in turn are a good deal more efficient than Plasmas, according to Which? Not strictly an appliance, granted, but replacing old incandescent light bulbs with energy efficient versions can save you £3 a pop. Energy generation and renewables These measures aren't about upgrading what you already have, but investing in technologies that allow you to generate your own energy. 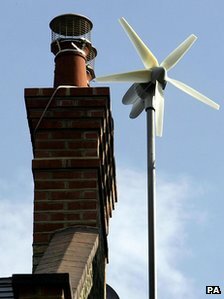 As a result, they can be quite expensive, which is one of main reasons why the government is launching its Green Deal. 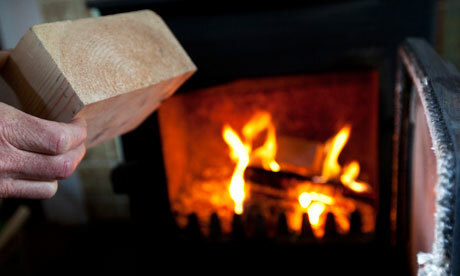 One way is to use wood to heat your home. According to the EST, replacing electric heaters with a wood pellet heating system could save as much as £580 a year. Carbon emissions would also be reduced, as the carbon dioxide given off when burning is offset by the carbon absorbed by the tree from which the wood was cut. Solar panels are another popular way to generate power, and can typically provide about three-quarters of an average home's electricity needs. Wind turbines are an alternative that, if situated in the right part of the country, can provide more than enough electricity to power a typical home. Government feed-in tariffs mean you get paid to generate electricity, and for selling any excess to the main grid. In fact, one turbine could generate savings and income of more than £3,000 a year including tariffs, the EST says. Another option is heat pumps, which take heat from the air or the ground but which need electricity to run. In some cases, these are better at saving on carbon emissions than money. You will need to calculate the payback time carefully when deciding whether to invest in any of these technologies. But remember that if you sell your home, the buyer can also benefit from the cost savings, which can add to the value of your property in their eyes. Trianco have been providing quality heating products for some time so I feel it is time we had a look at some of their products. This time we are going to be looking at the modern styled Trianco Newton Stoves, now firstly these stoves come in a 5kW and 8kW option. These options provide the 5kW or 8kW heat output respectfully and have up to 78% efficiency. The Newton stoves have quite a modern/contemporary design, simplistic in many ways, but this is a design feature as the newton stove has been made to have all the modern features expected from a stove but not confuse the user with several controls and settings. The Newton is a British made stove and can burn a wide variety of solid fuels, including wood (seasoned hardwood recommended) or peat/turf briquettes. 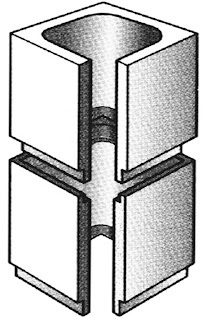 Both varieties of the stove can come with the option to have a pedestal. This raises the stove from ground level and changes the appearance of the stove. When accompanied with the pedestal the stove is easier to clean and load, and there is also a place to store fuel under the stove, however for many this moves the stoves from the traditional setting expected when buying a stove. The 5kW model may be top or rear flued,(5inch flue), for many the positioning of the flue pipe is important to the aesthetics of the stove, so having the option to choose is a bonus. The 8kW stoves have a 6inch flue and may only be top flued when being used with the optional boiler. The boiler option can provide hot water and be used with radiators, this option is becoming more and more popular as we all look to improve the efficiency of our homes and reduce our carbon footprint. Of course by using a stove and burning wood you are doing this, but many are going all the way and using a boiler that is heated by the stove to even better the environment and the use of the heat emitted from the stove. Some stove users will have the underfloor heating in their homes powered by their stove, which is great if you can afford the time and money! Trianco Newton stoves stylishly have tertiary air intake that creates a triple-burn system ensuring clean and complete combustion for higher efficiency and lower emissions. 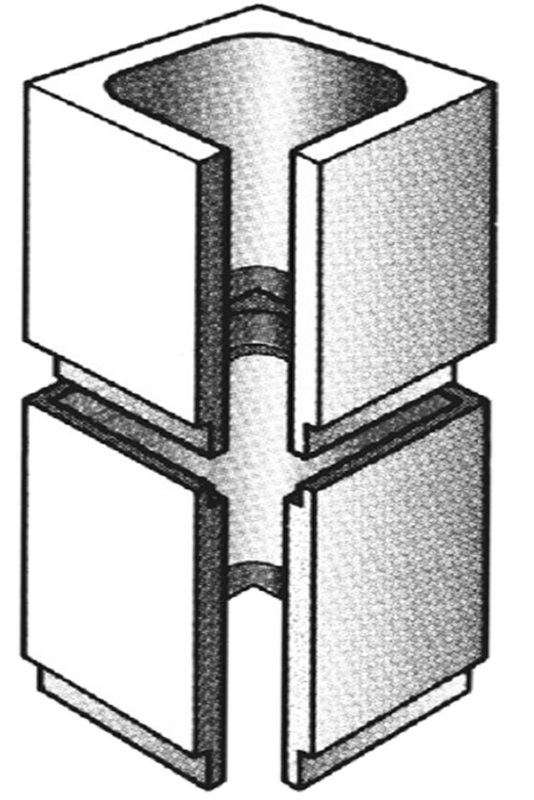 The modern design is created by 5mm thick sheets of steel being laser cut into the desired shapes for assembly, this level of thickness is excessive of current regulations, and to add even more efficiency and longevity to the stove the Newtons have vermiculite bricks installed that encourage the retention of heat. Other great features include the unique handle and control design and the stove comes complete with a cast iron grate, an ash pan and operating tool. Another great example of great British design and engineering and a company worth considering if you are looking to purchase a modern stove. Legend Fires have released the new Virage range, a range of open fronted, high-efficiency gas fires, taking all the best bits of the already popular Vantage range and combining it with the high-effiency of the Evora range to create the new Virage fires. 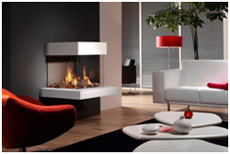 These new open fronted gas fires offer a maximum heat output of 4.6kWand efficiency of up to 68%, these open fronted gas fires give a similar efficiency rating to that of a glass fronted fire, but without a glass front, which can be viewed as a major advantage over the glass fronted fires. You don't have to worry about cleaning glass that has condensation marks and no reflections from the glass possible detracting from the look of the overall fire. The Virage range are available in three different styles, the Virage HE, Virage Contemporary HE and the Virage HE 4 Sided gas fires. These fires are all avaiable in Brass, Polished Chrome and Black with the choice of five different fuel effects, choose from the standard coals, pebbles with the options of a new ripped coal fuel effect as well as the choice of modular coals or pebbles. 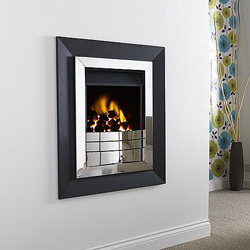 The Virage HE 4 Sided gas fire looks stunning with the polished chrome trim with coal fuel effect and black outer trim, the beautiful contrast between the polished chrome, the black interior and exterior trim, especially when placed on a white or pale coloured wall really makes the fire stand out. The picture right shows the fire on a feature chimney breast in a plain white finish, contrasting the feature wallpaper either side, really drawing attention to the fire. Comes with Manual rotary control as standard with additional extra Slide or Remote control, Suitable for Class 1 chimney's & class 2 prefabricated flues running Natural gas only available and with Depth of 195mm fully inset, the Legend Virage Range of High Efficiency Convector fires are a must for those looking to save energy but not interested in having a glass front on their fire. If you have a standard masonry chimney and wish to install a woodburning or multifuel stove, it is highly advisable to fit a stainless steel flexible flue liner with the stove. Masonry chimneys, particularly in older properties, are likely to have cracks. Without a liner, any fumes from the stove and creosote formed will leak through cracks in the masonry, possibly exiting in other rooms in your house or in your neighbours'. Creosote is a tar like substance that is formed when fumes emitted from the stove cool down as they rise. When these gaseous fumes cool down, any substances contained within the fumes condense and are deposited on the inside of the flue or chimney. A flue liner has a smooth inner skin with less surface area for creosote to be deposited onto, whereas in a masonry chimney it is likely to build up in cracks or crevices. Creosote is highly flammable and is often the cause of chimney fires. A flue liner is much narrower than a chimney and is the same diameter from top to bottom. 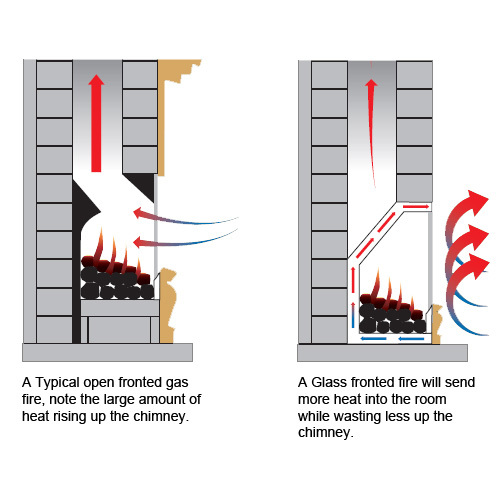 This continuous, consistent pathway will allow the flue gases to exit the chimney much quicker, with less chance of deposits. A flue liner's narrow, consistent diameter also means that it will warm up much quicker than a chimney. This results in an improved draw, making it easier to get a fire burning without lots of smoke back into the stove. A flue liner will retain the heat longer than a chimney after the fire has died out, which means it will be easier to start a new fire the morning after the night before. 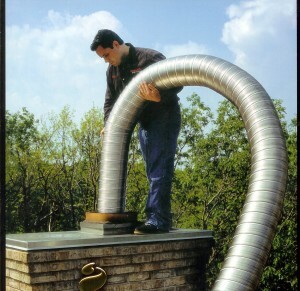 A flue liner is generally more straightforward to sweep. Creosote deposits formed will be harder to remove from a large chimney, especially build ups in cracks or crevices. 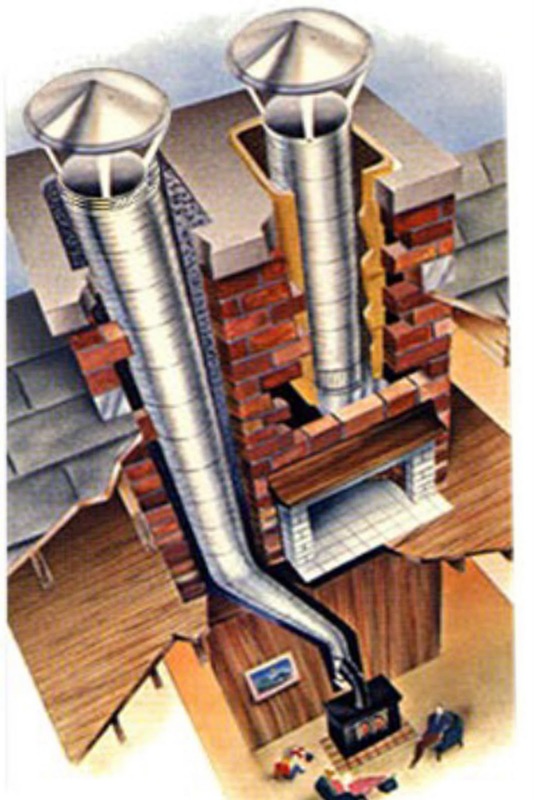 A question frequently asked is whether the flue should be insulated - this is done by backfilling the chimney around the flue liner. This is not necessary, but can be beneficial if you have a particularly cold chimney i.e. external, very exposed and very large. Normally the warming of the air in the chimney surrounding the liner during burning is sufficient for insulation. They are also frequently asked whether a flue liner is necessary to comply with building regulations. It does not state in the building regulations that a flue liner has to be fitted with a stove. However, you must be sure that the chimney is in good working condition and has been sufficiently maintained. The majority of installers and retailers will recommend fitting a flue liner; particularly in older properties, as it is safer and more efficient. We do not advise asking your installer not to fit a flue liner purely on the basis of cost. Once you have made the one off investment, your stove and flue liner, if properly maintained, will last for years. Most stove and flue manufacturers offer a warranty on their products - for example, Corinium offer a ten year warranty on our flue liner, subject to conditions of use. These are troubling times for Britain's manufacturing sector, once a relative bright spot in the country's lacklustre recovery, which contracted at its fastest pace in more than two years in October, as new orders plummeted. 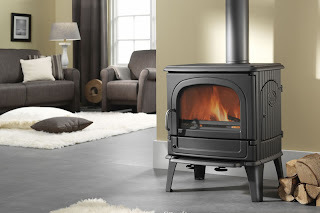 But at a time when the weather is closing in and people are looking to replace their fire or stove, many will simply head down to their local DIY or home-improvement store and buy an off-the-shelf stove or fire. However there is quite a high likelihood that these stoves and fires were built overseas, while there may be nothing wrong with stoves and fires, they may serve and satisfy all your heating needs. However it is always nice to know exactly where your stove or fire has been built. In this article we have a look at some of the most popular British products on the market and have a look into where they are created. The Portway 2 Multi fuel stove is a contemporary steel stove which features a large viewing window and is exceptionally easy to operate. 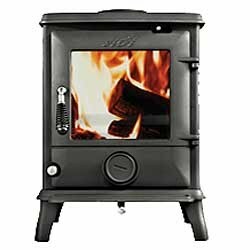 With a choice of 2 stove colours; charcoal or black, and 3 leg heights this is a highly versatile stove. You can also choose to customise your stove with our range of decorative window inserts or vitreous enamel doors in Ruby Red or Arctic Grey. The Portway Range of stoves are built by BFM Europe, the company is based in Stoke-on-Trent with a 51,000 sq ft purpose built plant, housing the most up-to-date manufacturing, sales and training facilities in the industry, including the latest sheet metal technology, R&D department and purpose built laboratories. Paragon & Matchless are both part of Charlton & Jenrick, startedby two friends in 1986 and based in Telford they produce a wide range of gas and electric fires, ranging from the stunning Chorus hole in the wall gas fire to the Quartet balanced flue fire and a stunning range of electric fires. Twenty four years later the Charlton & Jenrick Group moved into new premises, although just a stones throw from the original premises, are very substantially larger at 42,000sqft. It will be home to the group's gas fire manufacturing and product development operations, which employs 43 people. This high efficiency balanced flue fire is the Verine Marcello balanced flue gas fire, perfect for modern homes without a chimney or flue and features a natural stone fuel bed. The Marcello can be wall hung or inset into most external walls with stainless steel trim. Much like The Portway Range of stoves, The Verine Marcello is built by BFM Europe, the company is based in Stoke-on-Trent with a 51,000 sq ft purpose built plant, housing the most up-to-date manufacturing, sales and training facilities in the industry, including the latest sheet metal technology, R&D department and purpose built laboratories. 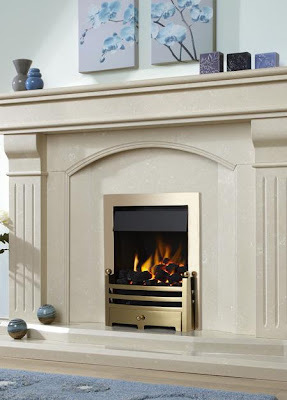 Evonic Fires is a brand of CK fires, situated in rural Warwickshire and are focused on provided a wide selection of quality fires, built in the Britain, available from many independent fireplace retail outlets. Evonic Fires have unveiled their latest offering. The Endeavour 3D hang on the wall electric fire. This ultra-slimline electric fire utilises the same technology that makes the Brilliant Newdawn-E so popular with the choice of seven different fascias to creates a stunning electric fire that not only looks good, but also gives a great heat output for an electric fire at 2kW with built in thermostat. Available in the almost standard electric fire finishes of black glass and gloss black, the Endeavour 3D also breaks from the norm offering the choice of Grey Mirror, Brushed Aluminium, Calcite White and Stone Effect. However the crowing glory of the Endeavour 3D is the solid Oak Fascia that is available, this truly combines the best of having a natural wood surround and inset fire with having a modern hang-on-the-wall electric fire. You can now view the Evonic Endeavour 3D complete with black glass fascia, alongside the Evonic Euphoria Stove and Almyra hang on the wall electric fire now on live display at Fireplace Megastore. DRU gas heating systems are used extensively in offices, workshops, industrial units and even large factories throughout the UK. 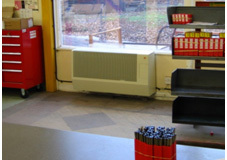 They can be used as the main source of heating for offices and industrial premises. They can also be used for supplementary heating in extensions to buildings or in portable accommodation. 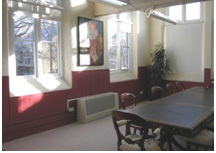 DRU office and industrial heating systems can be found in a wide variety of commercial premises, including a central London hedge fund company, light industrial workshops in many inner city locations, offices and studios by the River Thames in Twickenham and the distribution centre of an international tool manufacturer in Nottinghamshire. DRU heaters have been installed in many leisure environments, such as sports halls, visitor centres and even in zoos. This is because DRU Art and Style series heaters can be run on LPG and need no electrical supply, so they are suitable for remote sites, portable buildings, livestock accommodation and animal houses. DRU heaters have been installed in a large number of military establishments, from the far South West of England to the far North of Scotland. They are also used in British Forces headquarters in Cyprus and other overseas locations. They provide robust, efficient and reliable heating for military barracks, which are often in remote locations and subject to harsh weather conditions. DRU Art series heaters are most suitable for these kinds of premises as they can be run on LPG and require no electrical supply. So there is no danger of heat loss in the event of power failure. The DRU range of office and industrial heaters includes balanced flue models with heat outputs from 2 – 11 kw and powered flue models with forced air convection from 7 – 16 kw. They are available in a wide selection of colours and designs to compliment plush offices or more functional industrial and workshop environments. 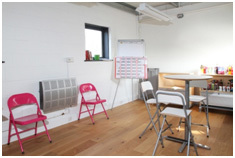 DRU provides a wide range of services for office and industrial heating throughout the UK. Operating through a national network of DRU approved GAS SAFE registered heating installers, we provide free surveys, consultations, installations, warranty work and servicing. You can contact us about servicing your existing DRU heaters. We also stock spare parts for many older and obsolete models. We love our wood-burning stove in the house we’ve just bought, but I have discovered we live in a smoke control area. This is the question faced by dozens, if not hundreds of individuals, couples and families faced every year as they purchase their new house, complete with stove, envisioning the stereo-typically romantic image of sat around the stove, the warm glow eminating from the window and bathing everyone in the warm glow. Putting an extra log on the stove as the fire every so often, just to top up the heat. However this dream can quickly become a nightmare if you become informed you live in a smokeless zone and your stove is not DEFRA approved. However not all is lost, you can still keep your stove, however you would be slightly restricted to burning smokeless fuels, DEFRA approved status merely means that the stove has been given approval by DEFRA to be exempt from the clean air act when burning wood. 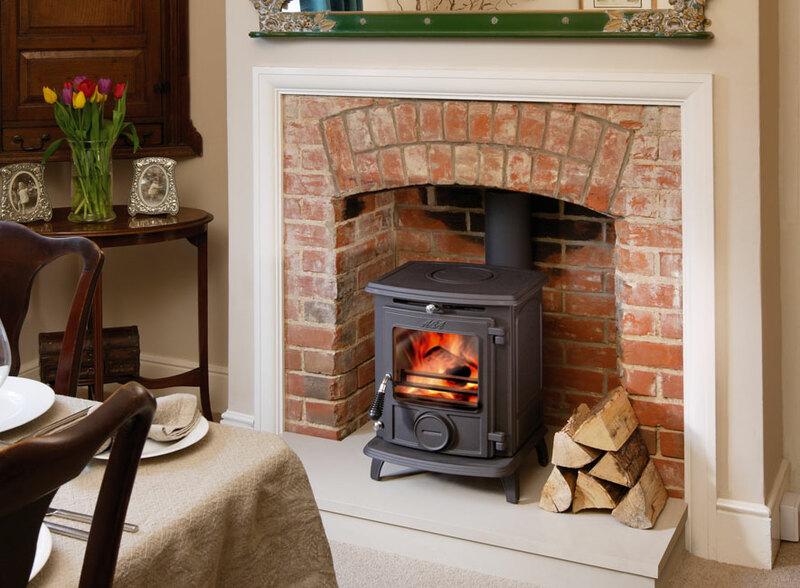 So not to worry if you've just bought a house with a stove that isn't DEFRA approved, you can still burn smokeless fuels and enjoy that romantic image of relaxing in front of a blazing stove with the room covered in the warm glow. The Aga Little Wenlock Classic stove makes a welcome appearance in the November issue of Ideal Home, taking pride of place in Matthew and Rebecca Stenson’s living room (p.30). The Stensons’ home is a new build cottage, located in a Cambridgeshire village close to Huntingdon. Although the cottage is only three years old, it has been faithfully built in the rustic style using a traditional oak frame with modern structural insulation panels. The Stensons have created a home rich with old world charm, but have incorporated the convenience of modern technology wherever possible. With underfloor heating and an air-source heat pump to keep their fuel costs down to around £80 per month, a wood burning stove is more a feature than a necessity. The Aga Little Wenlock Classic woodburner they have installed in their living room is a perfect fit for the character of the cottage with its timeless combination of traditional and modern aesthetics. However, the suitability of this stove for their home goes much deeper than looks alone. The Aga Little Wenlock Classic stove achieves fuel efficiency of up to 81.2%, making it a good fit for the eco-friendly ethos of fuel economy seen in the rest of the Stensons’ heating system. 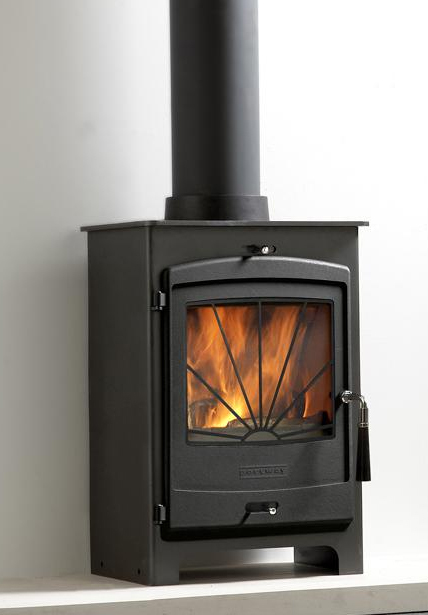 The Little Wenlock Classic stove has a heat output of 4.7kW. This gives it the power to keep a small living room toasty warm in the worst of weather, but also makes it ideal for supplementing central heating in a medium living room such as the Stensons’. The Stensons have gone for high quality materials wherever possible both in building and decorating their home. It is no surprise therefore that a solid cast iron woodburner would appeal to them. Aga are renowned for their quality control, being unwilling to release stoves with even the smallest superficial defect. While there are cheaper stoves on the market with similar designs, a close-up comparison will always show the Aga stove to have a flawless finish where a budget stove may well have the odd rough edge. The Verine Orbis Plus full depth open-fronted high efficiency gas fire provides an incredible 74% net efficiency and the appearance of a real coal fire. 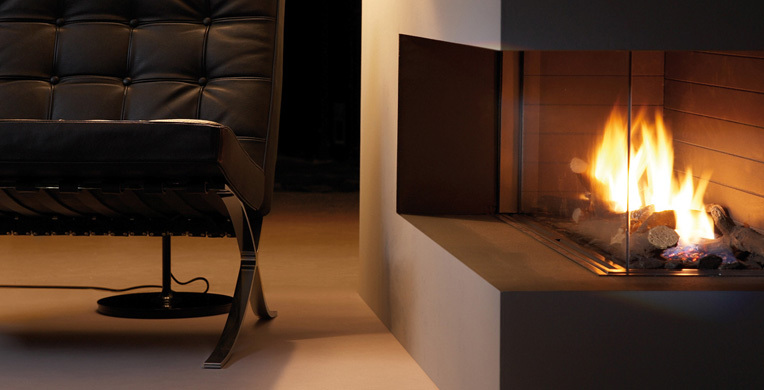 The Verine Orbis Plus is our first full depth open-fronted high efficiency gas fire. You can now achieve the look of a real open coal fire at an incredible 73% net efficiency. It features a mesmerizing and highly realistic coal fuel bed making this product one of the closest things you can get to a real coal fire and comes with the almost standard Flame Supervision Device (FSD) and Oxygen Depletion Sensor (ODS) for safety. Suitable for installation into standard brick chimneys the Orbis Plus comes in a choice of manual, slide, easy flame or remote control and can be styled to suit your home with our wide range of trims and frets ensuring you'll get the product that is just right for you. Keeping stove windows clean is a complex subject and varies for each appliance, type of fuel and other operational differences such as overnight burning. All of which can then be affected by chimney performance. Most modern stoves have an "air-wash" built in. This is basically a curtain of air that is desigend to flow across the surface of the window and stop any carbon being deposited onto the glass. Air-wash works best when the appliance is fully up to temperature, with the heat from the fire being the main driving force of the air across the glass. However when the stove is first lit or when all the air controls are shut for overnight burning the airwash is significantly reduced. It is at these times when the deposits of combustion materials, condensation or sooting most often occur on the glass. On start-up, the window is cold. Water vapour escaping from the burning fuel (even the most seasoned wood will still probably contain 15-25% water) reaches the cold surface of the glass and condenses, this vapour normally carries with it a waxy like substance which once deposited on the glass acts like a magnet and deposits more and more onto the glass. However once the stove has heated up these deposits burn away relatively quickly, with more stubborn carbon deposits normally burnt off at a higher temperature. But inorganic oxides produced are often left behind and then burnt onto the glass, the process repeats itself with more area for further deposits and this can quickly escalate once the process has begun. On shut-down, or for overnight burning the air-wash control is normally fully closed. The fuel burn rate drops and inefficient and incomplete combustion can occur. The speed of the air in the air-wash is now too low to carry away any of the heavy combustion products which will lead to them being deposited on the glass. Unfortunately it's not a case of stopping it, as once the process has started it becomes a landing spot for more and more deposits to land on the glass, its more a case of preventing it. .
To put it simply, the cleaner the glass is kept and the more air-wash present during operation, the cleaner the glass will remain. Not burning wet or unseasoned wood. Allowing the last refuelling of the day to burn on high for half an hour or so before turning the air wash down. In short, it's the common-sense factors that can ofter prolong the clear view. If the surface does become slightly marked most glass manufacturers recommend tepid water and a lint free cloth, with gentle pressure and irregular motion the marks should come off, but remember to allow the glass to dry before firing up the stove. Should the window become more heavily marked then a specialist ceramic glass cleaner is available from most local hardware or DIY shops. Followed by a water wash and thorough drying. It is best to avoid traditional acid based window cleaners or abrasive oven cleaners, as well as the traditional meothod of newspaper dipped in spent ash, as fine abrasive ash can damage the surface of the window. Actually making it easier for deposits to build up in future. The Hillandale Stoves Lincoln range is a stylishly craftedstove selection of conventional flue gas, balanced flue gas and electricstoves. Hillandale with the Lincoln have moved away from their conventionalmulti fuel stoves to now offer an even wider and better choice for theconsumer. The Hillandale Lincoln Balanced Flue Gas Stove is moresubstantial in its proportions have a depth of 380mm. The balanced flue meansthat there is no need for a conventional flue; the stove is flued directlythrough an existing external wall to the outside. 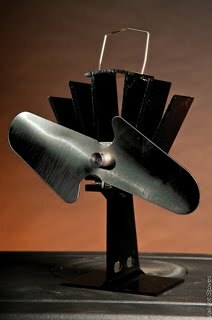 A superb invention that workssimilarly to many combination boilers, and allows many homes to feature a fireor stove when they couldn’t in the past. As all the Lincoln stoves this isconstructed from cast iron and has eloquent styling details. 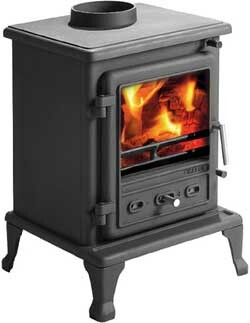 The Hillandale Lincoln Electric Stove is a freestandingstove with an overall 350mm depth and fantastic design. The electric versionoffers a 2kW heat output and benefits from the fact you can simply plug it in,turn it on, and start warming the room. The Lincoln electric stove does notneed a flue; in fact additional ventilation is not normally required at all.The fuel effect can either be a realist coal or log bed . The Hillandale Lincoln collection offers homes without aclass 1 chimney the opportunity to have a Hillandale stove within them, tocreate a focal piece within a room whilst providing warmth as well, superb! Asif appearing from the doldrums emerges Hillandale Stoves a well presented brandwith stoves and cookers in its portfolio, but who is Hillandale Stoves, whatproducts do they have and will they be around to honor the warranty? If youwant to know the answers then read on. Hillandale Stoves as a brand are fairly new, but this is no need for concern asthe Hillandale brand hails from two very well known and respected companies,Brosely fires and Bemodern. The Hillandale stoves range is very similar to theBrosely fires range of stoves, and have the same superb build quality anddesign as each other too. 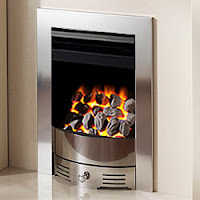 Broseley became part of the Bemodern group in 2009, they added to the BemodernGroup by providing the stove element that Bemodern was somewhat lacking fromtheir large array of products. Hillandale therefore come from the best possible back ground, and have providedthe stove outlet Bemodern desired, they are set to go from strength tostrength, and have a stylish and functional range of stoves and cookers, somewith boiler options and are already onsale across the UK at the moment. It is pretty much guaranteed that Hillandale willcontinue to release stylish, functional and desirable products in the nearfuture. Any concerns over warranties would be unjustifiable, and I look forwardto seeing the future developments Hillandale Stoves provides in years to come. Hillandale Stoves have a superb collection of multi fuel stoves,which can burn an array of fuel and a combination of fuel effectively andhighly efficiently. With energy efficiency in our thoughts, and the constant rise in electricand gas prices, many homes in the UK are becoming more energy efficient, becauseof this a recent interest in multi fuel stoves has arisen. Multi-fuel stoves,particularly cast iron multi fuel stoves, are not only having the option ofburning a selection of fuels but can burn clean fuels and renewable fuels too,ensuring a cleaner environment and producing supreme heating to your home. The Hillandale Stoves Multi Fuel collection includes theHillandale Monroe, Hillandale Monterrey and Hillandale Hercules Boiler Stovesand they are available from a number of retailers online and in showrooms acrossthe UK. The Hillandale Monroe Multi Fuel Stoves are available in several sizes withdiffering outputs allowing a suitable stove for most room sizes. The Monroe 3,Monroe 5 and Monroe 7 have the potential maximum heat output as that numberspecified in the name, so the Monroe 7 has a heat output of up to 7kW. Thestyling of the Hillandale Monroe is one that would suit a more traditionalsetting and will create a feature in most rooms and homes. The Hillandale Monterrey Multi Fuel Stoves similarly to the Monroe stoves comein three available sizes, the Monterrey 3, Monterrey 5 and Monterrey 7. The potentialmaximum heat output of the stoves also correlated to number in the name. TheHillandale Monterrey however has much simpler design and would lend itselfbetter to be featured in a more modern or even contemporary setting. The largeviewing window on the Monterrey stoves means that when the stove is rapidlyburning a stunning and mesmerising focal point is created. 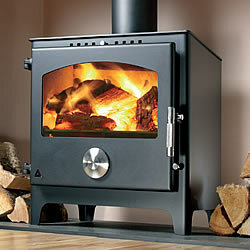 The Hillandale Hercules Multi Fuel Stoves are the largest multi fuel stovesthat Hillandale provide at present. These are boiler stoves and provide heat tothe room as well as heat domestic hot water supplies as well as radiators.Available as the Hillandale Hercules 12, Hillandale Hercules 20 and HillandaleHercules 30, (like the other stoves the numbers in the names relate topotential maximum heat output) they power differing amounts of radiatorsdepending on their size. Hillandale multi-fuel stoves are made in the United Kingdom and have solid castiron construction, and the stoves have many additional features like Primary,secondary and tertiary air flow control and riddling grate etc that make themfunctional, effective and controllable. All of the above stoves are suitablefor class 1 flues, so if you have a brick built chimney in your home then theseshould be fine in them. A general note on safety to any one consideringone of these stoves is that they are extremely effective at heating, hence theuse of cast iron, however they can heat up to very high temperatures and willhold the temperature for some time. Because of this it should be recommendedthat additional care is taken when children and pets are in the household.